Pristine Auction has prepared as special one-day auction on February 7th, 2016. This features a selection of all kinds of autographs and memorabilia, sports card and collectibles; all carefully selected for a day of bidding. All items will be opening at $1 with no reserves. The entire catalog is available for viewing now, and bidders may contact the auctioneer to place absentee bids directly. Collectors of boxing related autographs are going to be interested in this auction catalog. The first lot in the auction, Lot 1, is an 8×10 photo of Mohammed Ali and Sonny Liston that is signed by famous boxer Earnie Shavers. 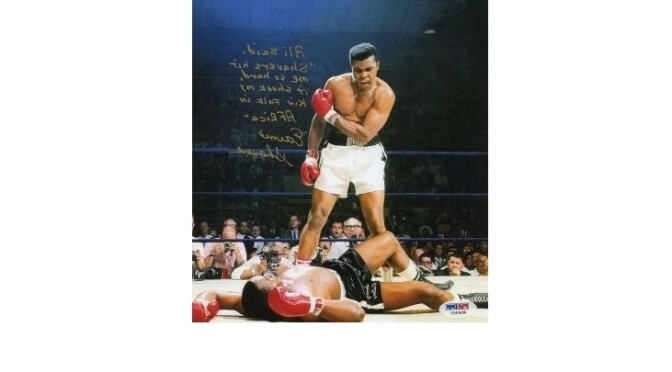 There is an inscription from Mr. Shavers that says “Ali said, Shavers hit me so hard, it shook my kin folk in Africa”. Shavers was considered one of the hardest punchers in boxing history and challenged Ali for the title in 1977. There is an authentication hologram includedFurther with boxing are a pair of Mike Tyson pieces. First at Lot 12 is photo of Tyson in his fight with Evander Holyfield that he has personally signed. The photo is 16” x 20” and has been hand signed in blue felt-tip pen. The autograph includes an official JSA hologram and matching COA. The next lot, number 13, is a fabulous piece for lovers of the great video game Mike Tyson’s Punch Out from Nintendo. This is a photo that is 11”x14” from the game featuring Iron Mike winning by TKO. Mike has signed this photo in blue felt-tip pen and it also has a JSA hologram and matching COA. Both of these great Tyson autographs are up for auction to the highest bidder.Also included in the auction are signed sports collectibles such as a Magic Johnson autographed jersey at Lot 11, a Ken Stabler signed limited edition print at Lot 10, and a great Jim Palmer signed jersey at Lot 18. All items have photos and descriptions available, and winning bidders will always receive their COA and JSA holograms to ensure the best quality autographs.Bids open at $1 and there is no reserves; everything must sell. Bidders can contact Pristine auctions to discuss the items and place their bids. The auction will close on February 7th, 2016.